Whether it’s a pile of dirty laundry or days of mail to sort through when you get home from vacation, seemingly insurmountable tasks can paralyze you. Is there anything on your to-do list that you’ve been avoiding? Any daunting daily chores that make you cringe? Then let me introduce you to a simple solution: a timer. If you haven’t already tried working a timer into your daily routines, you will soon find that the expense is small and the benefits are great. There are a dozen types of timers out there. Try pulling out your old kitchen egg timer, stop watch, or even just the app on your phone. First, set it for a time limit that sounds reasonable, like anywhere from 10 to 30 minutes, and dive into those tasks that you’ve been procrastinating on. Once the bell rings, allow yourself to be done and move on to something else. The timer can help keep you focused, motivated and targeted on the individual task at hand. In some ways, it allows you to take a task and essentially cage it. It forces you to take the first step, which is usually the hardest. You may even surprise yourself at how productive you are! Who knows, you may even get into a groove and be motivated to work past the set time. To take this simple concept a little further, Francesco Cirillo wrote a book called the Pomodoro Technique that offers a method in which you take a series of 25 minute work sessions with 5 minute breaks, followed by a 15-30 minute break after every 4 “pomodoros”. 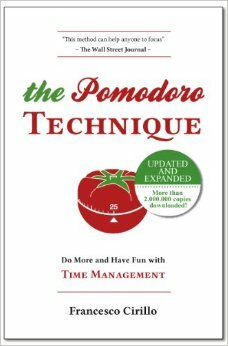 While you may not adopt this specific regimented method, the book is filled with insight on the benefits of timers and is a great place to start with your timer experimentation.